With condolences to Mayor Roberts and their entire family, MSV notes the passing yesterday of Anna Roberts his wife of almost 30 years after a long fight with brain cancer. She was 49. 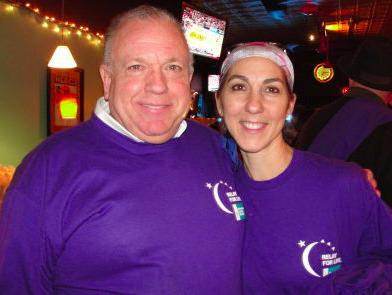 Dave and Anna Roberts at an American Cancer Society Relay for Life fundraiser in 2011. Anna is also survived by her parents, Domenico and Antonetta LaMastra, and mother-in-law Ann Roberts. She is the sister of Carmela and husband Sam Mezzina, as well as Damiano LaMastra and his wife Dina, Giuseppe LaMastra and wife Nadia, and Margherita LaMastra. She is also survived by her brother-in-law, retired Hoboken Fire Capt. Charles Roberts, and her aunt, uncle, several nieces and nephews, and cousins. Visitation will be Monday, Nov. 4, 2013 from 3 to 8 p.m. at Sts. Peter & Paul R.C. Church, 400 Hudson St. A Mass of the Christian Burial will be held at Sts. Peter & Paul R.C. Church on Tuesday, Nov. 5 at 10 a.m. Donations can be made in Anna’s honor to the American Cancer Society.